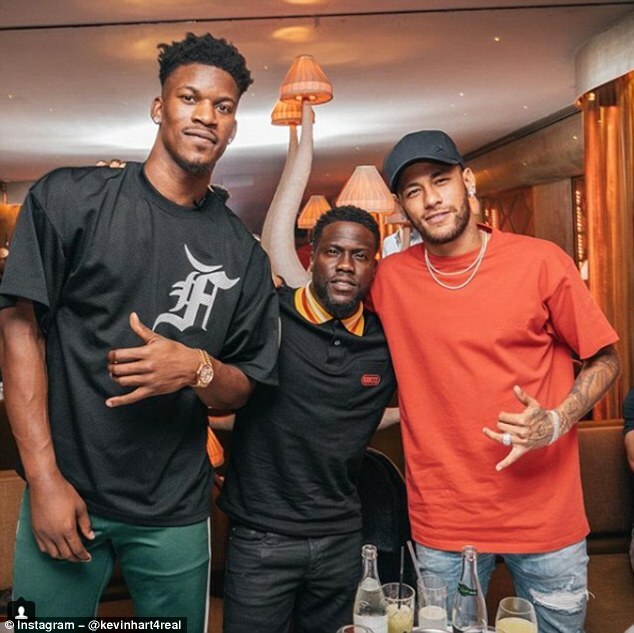 Neymar has been hanging out with stars outside of football, as American comedian Kevin Hart and basketball ace Jimmy Butler joined the Brazilian on a night out in Paris. An Instagram post of the trio was posted by Hart on his Instagram in what appears to be a swanky French restaurant in the capital. Standing at 6ft 8in, Butler – who has spent a year at the Minnesota Timberwolves – has been sporting PSG and Brazil kits over the past few months and took the chance to meet the striker. Neymar also posted individual pictures of himself with each of them in the restaurant and he captioned the one with Butler saying ‘Nice to see you bro’. 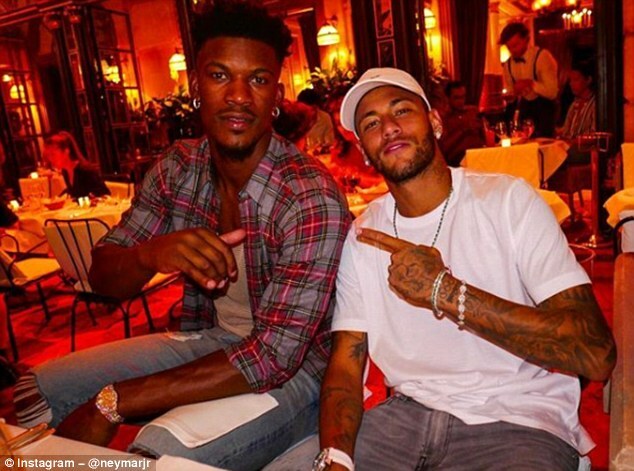 Butler responded by adding a picture of the pair together on his social media, referring to Neymar as the ‘G.O.A.T’ (greatest of all time) in his accompanying caption. 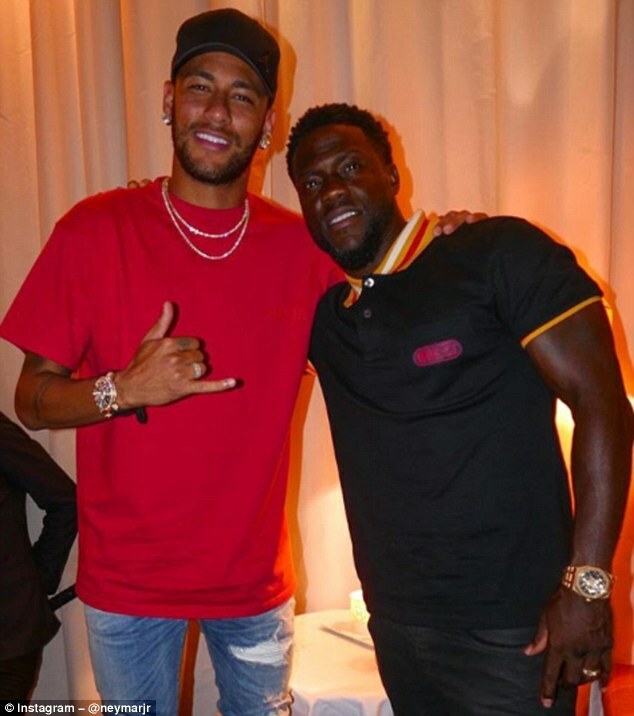 As for 39-year-old Hart – who was in Paris for one leg of his ‘Irresponsible Tour’ of Europe – Neymar captioned ‘It was nice to meet you… I’m a big fan!!’. After a disappointing World Cup finals, which saw Brazil knocked out by Belgium in the quarter finals, Neymar has begun the new season at PSG strongly. The French champions under Thomas Tuchel, are seeking an eighth Ligue 1 title this season. They ran away with it last term after finishing 13 points clear of runners-up Monaco. The 26-year-old forward has got himself on the scoresheet twice in the opening two games, one of which included a 53rd minute penalty against Giungamp. PSG are next up against Angers in the Ligue 1 clash at the Parc des Princes on Saturday, before having to make a trip to Nimes on September 1, a side who have similarly made a good start to the new season picking up maximum points.